Managing midstream businesses given fluctuating commodity pricing, contractual terms, and processing conditions requires an integrated view of the midstream enterprise spanning gathering and processing assets. 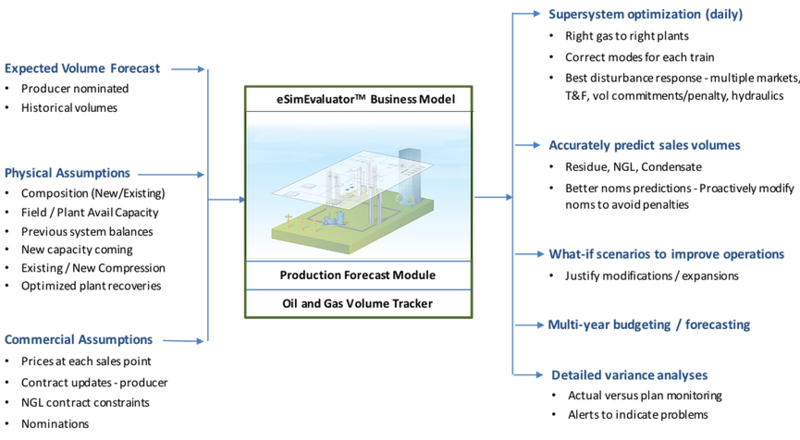 eSimulation provides a comprehensive Midstream Modeling and Optimization Platform that allows midstream executives to manage these fluctuations, optimize supersystem assets, and combine supersystem models for enterprise-wide optimization. eSimulation has witnessed strong findings by using the Midstream Modeling and Optimization Platform to identify and evaluate profit opportunities. A $250,000/month value opportunity was realized from identifying – and allowing the midstream company to mitigate – an issue resulting from a processor election option. 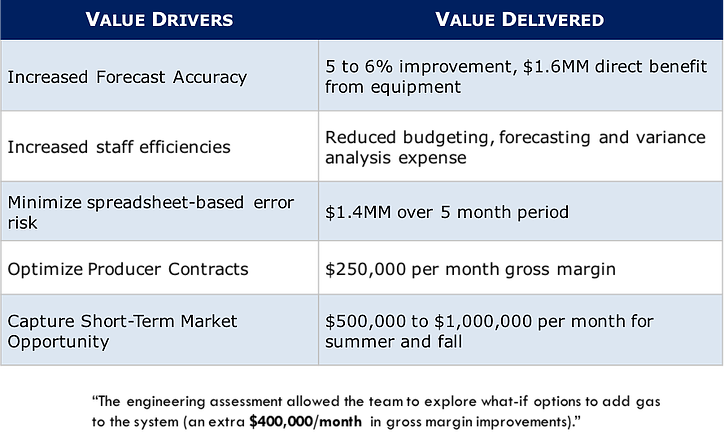 $500,000 – $1.0 million/month was realized during the summer and fall period by allowing managers to identify a pricing anomaly and to proactively adjust their hedging strategy to mitigate the problem. $300,000 was realized by identifying a settlement issue whereby the producer was under billed $500,000 over previous 3 year period. Processor used the lookback capability of the eSimEvauator business model to make their case and negotiated a $300,000 reimbursement payment. Support Funding Transactions – Supports business growth and new opportunities by developing credible pro forma and associated sensitivity calculations. Sensitivity analyses run considering various changes in commercial and operating assumptions to assess EBITDA and risk impact. Eliminate Spreadsheet Risks and Inefficiencies – Spreadsheets are not free: multiple groups using disparate spreadsheets – often overly simplified – requires building and maintaining multiple spreadsheet tools. Replaces multiple, standalone spreadsheets, such as forecasting, gas supply, accrual, planning and budgeting with a comprehensive business model. Supports lookback analyses and provides an audit trail. Reduce Effort for Variance Analysis – Dramatically reduce the effort to generate accurate variance analysis. Easily evaluate price & volume variations and their impact on gross margin. Quantify the opportunity for more effective management of other business drivers to improve profitability.